I’ve given myself two challenges this week: write a blog post daily, and give my weight loss effort a boost. Not the easiest task when you write a blog about cooking, but I figured that adding some new dishes to my healthy cooking repertoire would help both my causes. So! Every day I’ll be posting a new recipe with step-by-step instructions, photos & tips—plus Weight Watchers Points Plus values of each dish. 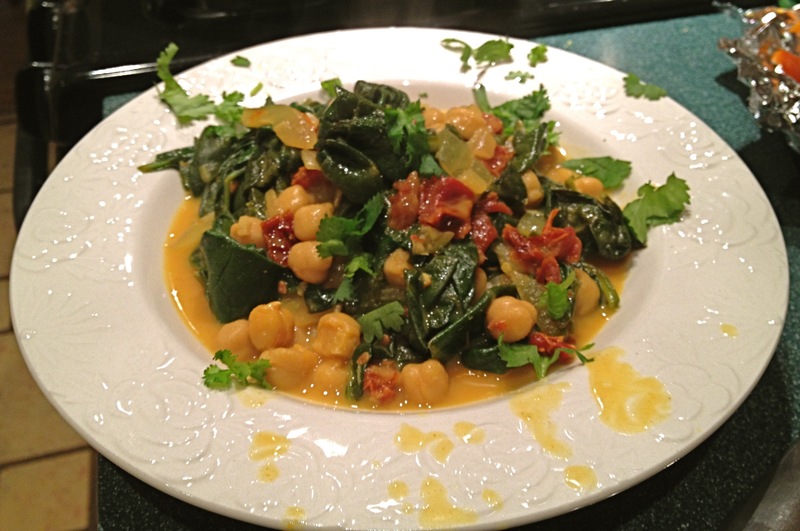 First up: Braised Coconut Spinach with Chickpeas and Lemon. As I combed the interwebs for recipes this weekend, I came across this one on The Kitchn. (Oh Kitchn, how I heart thee!) The minute I read the post I knew I wanted to make this dish. For one thing, it looks beautiful—the sight of the bright orange broth, bold green just-wilted spinach and pops of red from the sun-dried tomatoes all mixed together is really mouth-watering. Pretty colors, complex flavors, and healthy? Sign me up. The other major attraction: flavor. I’ve combined chickpeas and spinach in dishes before, but never with coconut milk and lemon, and it’s the zest of the lemon that adds a special touch of the exotic to this one. I tweaked the recipe only slightly from the original—I used light coconut milk instead of regular, and added hot curry powder and turmeric (my standby spices any time I make a savory dish with coconut milk). I didn’t have fresh ginger on hand, so I skipped it entirely and ultimately didn’t miss it at all. The recipe is super simple and pretty quick—you’ll need about 30 minutes from start to finish, so it works for a week night post-long-day-at-the-office dinner. And since you can serve this dish with sweet potato and/or rice, pasta or any grain, you can let those cook while you’re focusing your attention on the pot full of pretty, aromatic awesomeness in front of you. 1/2 cup chopped sun-dried tomatoes (not packed in oil). This is about 2 oz whole dried tomatoes. Heat the olive oil in a large, deep Dutch oven or heavy stock pot over medium-high heat. Add the onion and cook for about 5 minutes, or until the onion is beginning to brown. Add the garlic, sun-dried tomatoes, lemon zest, red pepper, curry powder and turmeric. Cook for 3 minutes, stirring frequently. Toss in the spinach, one handful at a time. This will take about 5 minutes; stir in a handful or two and wait for it to wilt down and make room in the pot before adding the next handful. When all the spinach has been stirred in, pour in the coconut milk and stir in the salt, ground ginger, and lemon juice. 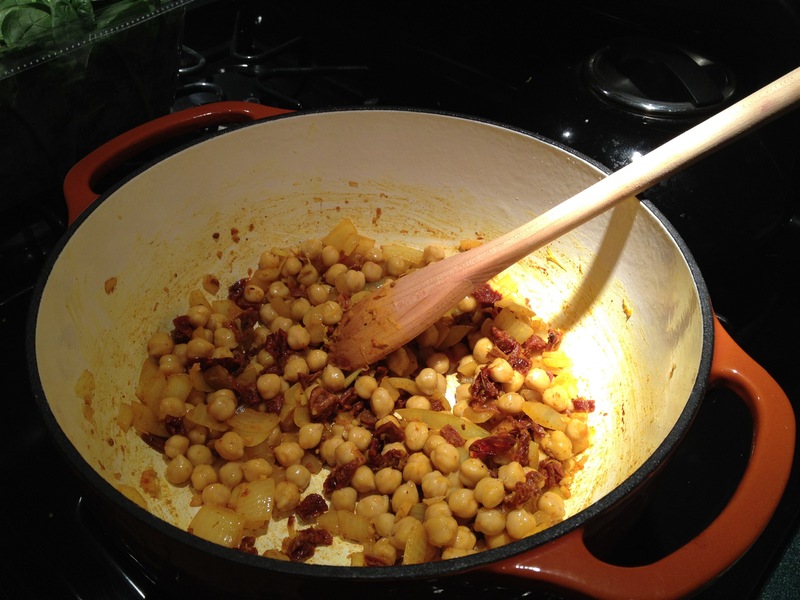 Bring to a simmer then turn down the heat and cook for 10 minutes or until the chickpeas are warmed through. Serve this dish over cooked sweet potato or over any cooked grain, rice or pasta. The Kitchn recipe calls for serving over roasted sweet potato, which goes incredibly well with the flavors of the sauce and adds a nice creamy texture when mixed with the chickpeas and spinach. Bonus: it’s super healthy and filling. 7 Points per serving; 9 when served with ½ cup cooked sweet potato. Leftovers will keep in the fridge for a couple of days and will re-heat well in a microwave—unless you’re using my microwave, which is a horrible device that specializes in uneven heating and disappointing its owner. 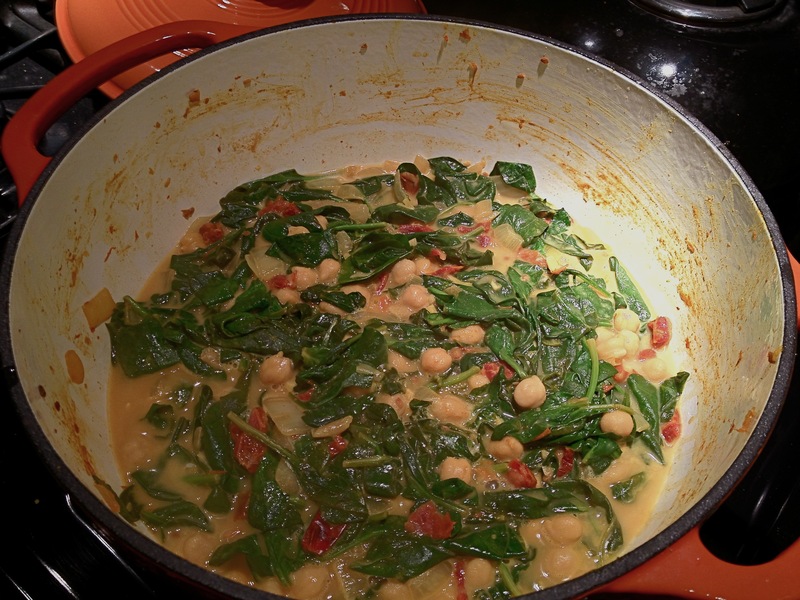 This entry was posted in Recipes, Savory and tagged braised, chickpeas, coconut milk, dinner, dutch oven, easy, filling, healthy, hearty, kitchn, lemon, light, mains, points plus, quick, spinach, vegetarian, weight watchers. Bookmark the permalink.